Running is beneficial for almost everybody, and not only because it helps you get in to shape. With advantages like weight loss, disease prevention and relieving stress, running truly is one of the healthiest things a person can do. But getting back into running after a nine-month pregnancy hiatus is no small feat. Running after childbirth is a whole new realm, and it is very much packed with its own set of advantages and challenges. Why Not a Regular Stroller? Researching strollers can be a long and time-consuming process. Being that time generally isn’t a luxury new and expecting parents can afford, we’ve taken it upon ourselves to do that hard work for you. 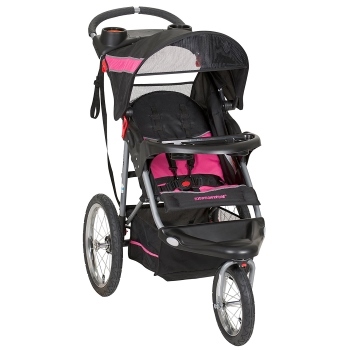 This is an infant jogging stroller with a locking swivel wheel that allows easy transition between walking and running. It is a lightweight portable stroller that has quick, one-handed fold and easily connects to an infant car seat. Moreover, this stroller also has deep compartments for holding keys, phones and wallets, with 2 additional cup holders – for water bottle as well as baby bottle. 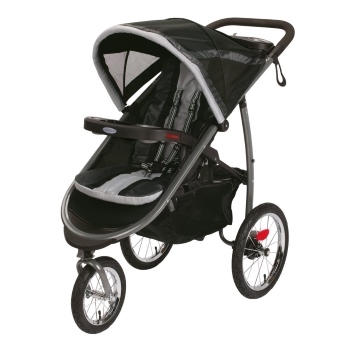 A jogging stroller with a swivel front wheel that locks straight, and an aluminum frame suitable for shock absorption. The stroller is an easy fold and made with easy to clean material (clean with just soap and water), ideal for life with a small infant. 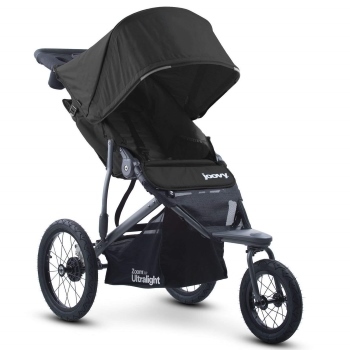 The jogger allows the baby to have plenty of visibility (through a protective peek-a-boo window) and a supportive seat as they join you on your morning run. Affordable pricing (in comparison to other brands. 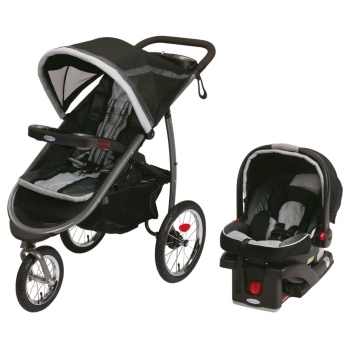 This jogging stroller has a locking swivel-front wheel, and a mountain bike style suspension system making jogging easy. It is easily adjustable, padded and comes with a large canopy to ensure the coolness of the baby. Moreover, the stroller can fit babies from birth to 75 pounds, and comes with an adjustable handlebar to make steering easy for people of every height. Material is durable, padded and easy to clean. Easily adjustable harness system, so that the seat can grow with the baby. 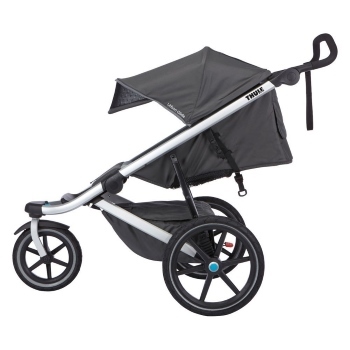 This stroller comes with large bicycle tires, allowing the jogger to roll over any and all surfaces. 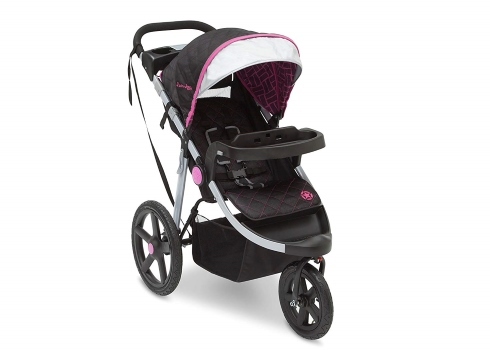 It has a front swivel wheel for easy maneuvering, that locks for effortless jogging. Also, the stroller comes with a parent tray with two cup holders, as well as a front tray for the baby. It is comfortably padded with a large canopy, and has a footrest for the baby’s comfort. This is jogger has a swivel front wheel that locks in place for easy transitioning into jogging and a rear suspension for a smooth ride. The handle bars are adjustable and waterproof with a padding that can be removed for easy cleaning. 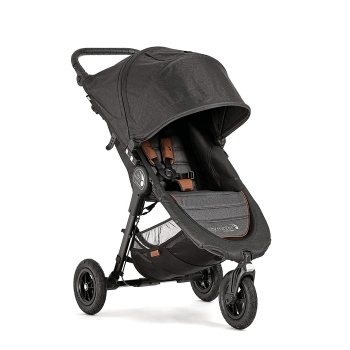 Moreover, the stroller has a seat that reclines to be almost flat and has a large canopy that protects the baby from the sun during your runs with an added magnetic peek-a-boo window. 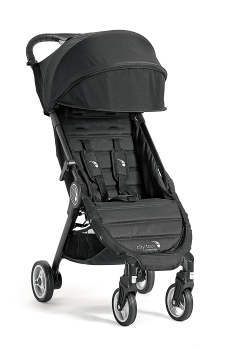 This stroller is light weight and has a one handed fold for easy storing. This jogger has three all-terrain wheels (no flats) with front wheel suspension and a hand operated brake. The seat is able to lay (almost) flat and has a vented seat top with a UV proof canopy and peek-a-boo window. Moreover, the seat is padded and comfortable and its cover can be removed be washed in a cold washing machine cycle. The stroller has an adjustable handle bar and is appropriate for use by people of all heights. Compact stroller, with one hand fold that automatically locks to make transporting easier. The stroller will easily fit into a backpack style carry bag, making storage compact, tight and easy. The baby seat reclines near flat and has a 5-piece harness to ensure baby’s safety. Includes UV 50+ sun canopy and canopy extension, with convenient peek-a-boo window for the baby. A basket is also located beneath the stroller to allow for easy storage. This jogging stroller comes with a five-point harness, and padded shoulders and seat to ensure child’s safety and comfort. It also comes with parent-friendly features, such as a padded handle bar, extra-large storage basket and a parent tray for smartphone placement. Moreover, the stroller folds to a compact size and locks closed to make traveling easy. Finally, the stroller comes with an extendable canopy (with a sun visor) and a play tray for children, that is easily removable to make loading and unloading easy. The Chicco Jogging Stroller comes with a removable arm bar and child seat to allow for the transition to a carrier frame for children in their first 6 months. The stroller has a hand activated brake and a deceleration brake to allow better speed control. Also, the handle bar is adjustable to multiple different heights. The stroller has a self – standing, one hand fold for easy travel and an extra-large canopy for baby’s comfort. Finally, the stroller has a one hand, adjustable seat, with five different reclining positions. This Graco stroller comes with an additional rear facing infant seat that can be connected to the main frame for infants. It has a locking front swivel wheel for an easy transition into running and air-filled rubber tires that ensure a smooth ride. Furthermore, this stroller has a quick one hand fold, to lessen the burden for on-the-go mothers, and a comfortable padded and reclining seat for their babies. Finally, the extra-long canopy and the added storage place allows for easy and enjoyable outdoor runs. Deciding when to start exercising after childbirth largely depends on how active you were while pregnant. Those who were active during pregnancy, are generally able to start exercising earlier than those who weren’t. However, all women are able and advised to begin with pelvic exercises as soon as they can following birth. Pelvic exercises help with urine control and regaining the strength of abdominal muscles. Jumping back into the 10 mile runs from before the baby can be a disappointing wake-up call. So, here are a few tips on how to ease your new body back into its old habits. Start Out Gradually – Starting out slow is an important part of getting your stamina back to what it once was. 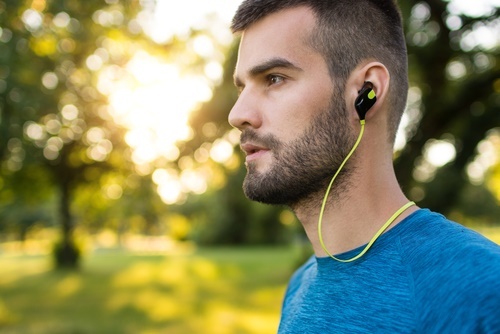 Start out with walking, and slowly begin to integrate short bursts of running in order to build stamina. Once you feel comfortable, you can tackle those long trails the way you used too. 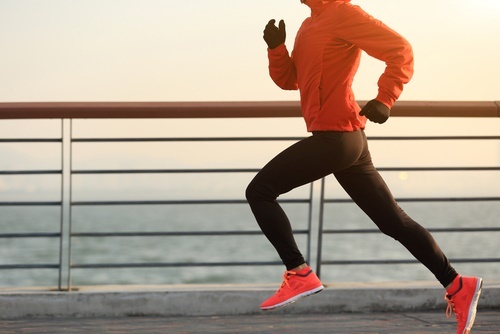 Run on Flat Surfaces – Flat surfaces are a great way to get a run in without adding too much-added stress to your joints and pelvic floor – which no doubt need some healing time. Choose Lightly – When you’re first starting out, avoid pushing strollers and carrying other heavy loads. However, if you have no choice but to bring the baby with you, invest in a lightweight, easy to push the running stroller (for less added stress). Run Rested – Even though new mothers are constantly tired, and the urge to get some energy through a run is tempting, only run after being rested. When you’re tired, you’re weaker and more vulnerable to injury. Avoid Contracting Pelvic Muscles – Keeping your pelvic muscles tight can result in pelvic floor fatigue, pain and muscle tension. Keep Good Posture – Although pregnancy promotes slumped forward posture, that sort of behavior can cause spinal strain and tends to decrease the activity of your core and pelvic muscles. So, keep good posture by lengthening your spine and raising your chest while running. Change Surfaces – Changing the surface you’re running can reduce the strain and impact running has on your body. So, ditch the treadmill and walk through a park with lots of different trails on lots of different paths. Make Sure to Eat and Drink – Don’t let your milk production take a hit because of your run. When breastfeeding, your body requires an increased amount of energy and fluids, so make sure your staying fed and hydrated while working out. Dress Appropriately – The ligaments on your feet soften with pregnancy, so make sure your well supported with a good pair of durable running shoes. Trust Your Body – Listen to what your body is trying to tell you, it knows how much you can handle – after all, this is part of what it’s made for. If you’re feeling tired, overworked, or fatigued it may be your body telling you that it’s time to take a break. Running with babies on board is a controversial topic with plenty of opinions going either way. 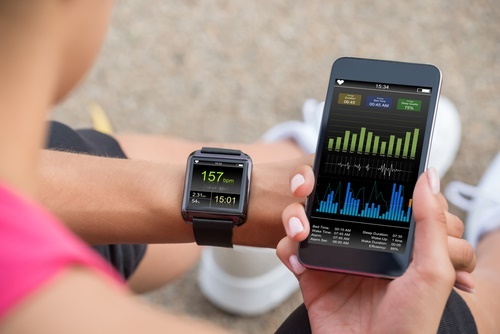 But nevertheless, if you have made the decision to start bringing your little one on your morning workout, then these are the best tips on how to keep everyone safe and ready. Watch Over – Your baby’s safety should be your number one priority. Make sure that you have taken all the necessary precautions when running with an infant, whether that be purchasing a jogging stroller with built in safety features, wearing reflectors in the night time or avoiding bust streets. “Bundle” of Joy – Remember that just because you’re running and warming up, doesn’t mean your baby is too. If anything, quite the contrary. While your racing with the wind, your baby is sitting still in the cold. It’s important to dress your baby for the weather outside; whether that be sun or snow. Planning Makes Perfect – Babies are on schedules too, and it’s important that they be in the mood for action before forcing them on a run. Get to know your baby, and when they’re happiest to be out in the world. Strap Them In – Not all strollers can be running strollers. 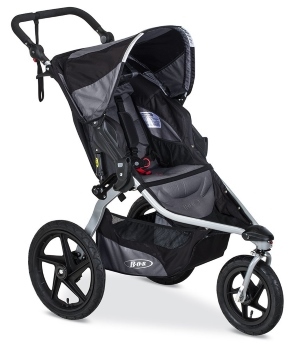 Jogging strollers tend to be built with durable wheels, and adjustable shocks to minimize bouncing. These, along with other features ensure the safety and comfortability of your baby while you work out. A running stroller is (generally) a three wheeled stroller with added safety features such as a locking front wheel, a five-piece baby harness and a single handlebar for one handed steering. Running strollers are built for the active parent, and its many features allow for smoother rides for both baby and parent. So, whether it be the smooth ride from suspension, the durable wheels, or any other of the countless advantages; a jogger is essential for any running parent. Regular strollers definitely have their own share of advantages. Not only can they be drastically cheaper than a jogger, but they are also significantly lighter and more compact when folded down. However, when running, a regular stroller can present a number of challenges. Ranging from the bumpy ride your baby will have to endure, to the cheap easy to break wheels. When it comes to a regular stroller, it just wouldn’t pass the test of time or keep your baby safe during your workout. Running with a stroller may seem like a hassle – especially given all the extra weight and the added stress of a baby. 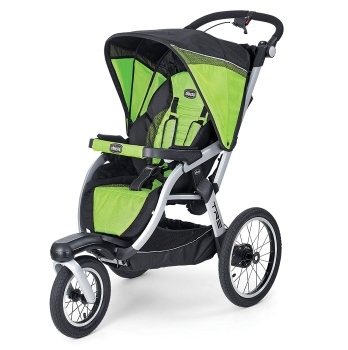 But really, a stroller can be a really helpful tool while racing through the great outdoors. Strollers are a great place to store all those extra things you never knew you needed on a run, suddenly one water bottle may not even be enough. And who knew you could take this many snacks? The handlebar could be a great stretching tool for unbalanced individuals. It’s no shame to be a little unbalanced, but it’s no great honor either. Using the handlebar could help you hide avoid those awkward falls and pesky trips by letting you stand and hold on tight. The stroller can help make sure that you keep correct posture and speed as you race up and down hills. Because the stroller is in front of you, it keeps you from running too fast or slouching to low. It ensures that you keep a steady stride and stand tall as you hold onto the jogger to keep it from getting away from you. That extra weight could turn out to be the extra few calories you always wanted to burn. The stroller may be heavy, and bulky, and annoying, but it is also a weight. And just like any other workout, added weight means added calories, so let your baby be your excuse for toned arms and speedy weight loss. Running with a stroller means running with your baby. And although the stroller may prove to be an inconvenience, y having the baby with you, you could turn your workout into bonding time with your new favorite person. You may not like working out, but maybe with the great company, those torturous minutes will become slightly less painful. But overall, maybe these months of stroller-pushing through park trails will provide you with a whole new appreciation on what it’s like to be running solo. Running without the added weight or stress of having baby and stroller with you will make solo running feel like breaking free. In conclusion, we know that your baby’s safety is your number one priority, but that doesn’t mean that your health or happiness needs to take a hit. Running has been proven to relieve stress, and what new parent could use a bit of that positivity? Overall, running strollers were created for this exact reason. There’s no reason why your workout can’t be one more safe, fun, and bonding experience for you and your baby. Shani has an undergraduate in English and has written several research papers and essays of topics that have interested her over the years. Since she is quite the sports fan, a few of them have been on nutrition and physical education.